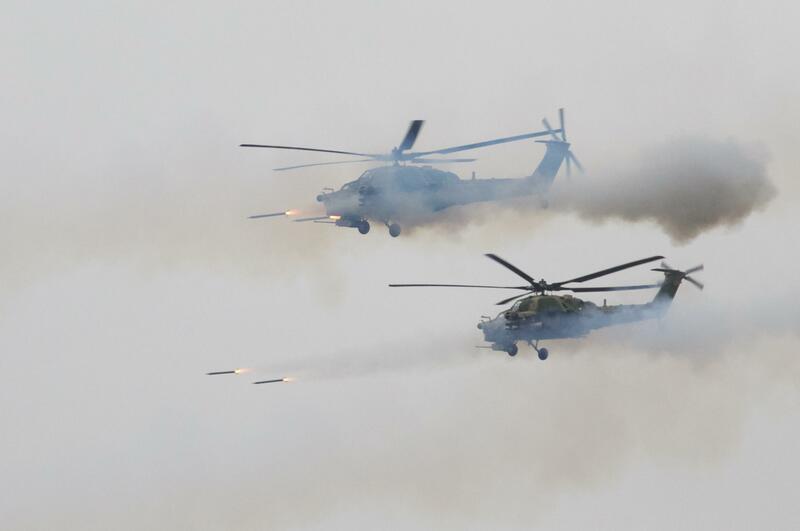 MOSCOW – A Russian military helicopter gunship accidentally fired on spectators during war games in western Russia, injuring several people, news reports said Tuesday. The Russian military acknowledged that a helicopter accidentally fired a rocket during drills, but did not say when and where it happened. It insisted that no one was hurt in the incident. The video released on the online 66.ru, RBC and Life.ru news portals showed a pair of Ka-52 helicopter gunships sweeping low at the Luzhsky range, about 60 miles east of the border with Estonia, during the Zapad (West) 2017 maneuvers. The video showed one of the helicopters firing a rocket that explodes next to a spectator on a parking lot. 66.ru said Tuesday two people were seriously wounded and two vehicles were destroyed in the incident. It said the accident happened Sunday or Monday, and that the video was provided by an unidentified witness. Life.ru said the rocket exploded near a crowd of journalists, military experts and foreign military attaches. It said a preliminary investigation by military officials indicated the incident was caused by a short-circuit in the helicopter’s electric system that resulted in the accidental launch of the rocket. Life.ru also posted a cockpit video, showing the rocket’s impact. Both Life.ru and RBC reported that the incident took place Saturday and say that three people were injured. The Russian military’s Western Military District acknowledged Tuesday that the video was genuine. It denied that it happened Monday, but didn’t specify when or where the incident in the video took place. It insisted that no one was hurt, and that just one military truck was damaged. The military said the incident was caused by the failure of the helicopter’s targeting system. The Zapad 2017 maneuvers, held jointly by Russia and Belarus, got underway Thursday at several firing ranges in both countries and run through Wednesday. The drills have rattled some NATO members, including the Baltic states and Poland, who have criticized an alleged lack of transparency about the war games and questioned Moscow’s intentions. Published: Sept. 19, 2017, 10 a.m. Updated: Sept. 19, 2017, 4 p.m.